I've extend the BT_TT_Junction Switch. With a new variable in editor, it will be possible to count the trains before switch the junction. Thanks for sharing! Great to see people getting use out of the system. The wheels / bogies are just a simple skeletal mesh with 4 bones, one for each wheeel that do a full rotation over 30 frames. The animation blueprint is very light weight and just plays that animation on a loop. The wheel speed variable is just the playback speed (forward, reveres or stop). To replace the animation you'd import your own animation, using the existing skeleton and then in the anim blueprint just set the animation that's playing to your new one. If you''re fully replacing the wheels / bogies then you'd need to import the new skeleton, setup the anim blueprint and make sure it's using the new skeleton and then set those in the carraige / mine cart as needed. Hopefully that helps and gets you what you need. If not, let me know and I can do up a more detailed response. We have just pushed an update to the marketplace to help build better track meshes and give more control over spacing and size calculations. Thanks to czoog, lalala312 and blackhawk71 for testing out the update before it went live and providing feedback. 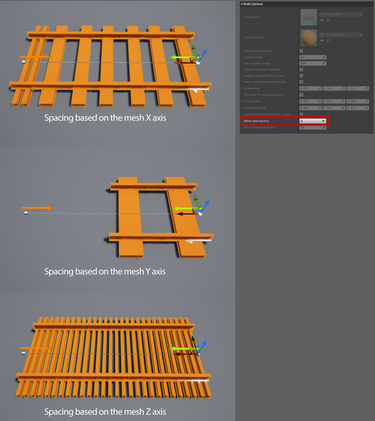 Three new options have been added to the tracks to control the mesh layout. The update is available via the launcher now, if anyone has any issues, feedback or requires any assistance, please ask. How do I export/migrate from one map to another? Two people working on a map, one is doing the train system and needs to export/migrate to the main map. When I choose to migrate for a track, for example, it makes me migrate the track bp always the same one, and also wants to migrate all assets used all the time, which is all the plugin essentially. That I don't have an answer for since that's more of an engine feature related to migration for all blueprint assets and not something that's controllable by the train system. I'll do some testing and see if I can find something that might help you. version of it still ,is it possible to leave it at the length of what it is ,or do I have to make the track a certain way so this wont happen. can I change the blueprints so I dont have to model it differently? This is excellent, nice to see people engaged and getting use out of the system, thanks! I just added some options to control the mesh size calculations (which axis gets used) and an option to disable the always adding a mesh to match the spline size (no more extra squished one at the end). I'll send you a PM with the download link so you can test it out, if it works as you expect and you like it, we'll push an update out to everyone. Would it be possible to pm that to mee too, am interrested in trying that out too. Thanks for the quick response. Not sure if my PMreply went through, this forum's messaging seems buggy to me. Let me know if you did not get it. Thanks! We have updated the marketplace files. If anyone has any issues, please let us know but everything is up and running to support 4.15 on. No longer any issues. Great fun playing with this system. Last edited by thadkinsjr; 11-28-2017, 02:22 AM. For the spline; Unfortunately you can't import an existing spline since. We did look at offering this, but it would have required releasing it as a C++ plugin instead of a Blueprint system. For the models; Just replace them, take a look at the demo blueprints, you can set the mesh there. For the chain and the loading station; check out the example maps, the trigger map specifically. There's already a trigger there to stop the train. You can copy the jump trigger and change that to be a chain trigger that will push the train up the tracks until the first carriage hits another trigger at the top and tells it to stop pushing. Hope that helps, let us know if you have any more questions or feedback.